When a rare puma dies during a government shutdown, who do you call? Dan Cooper didn’t know about the mountain lion until the local news media called on Monday afternoon to tell him. By that time, the animal had been dead for several hours; all anyone knew was that it had been struck by a car on the 101 freeway, which cuts through the Santa Monica Mountains on the way from Los Angeles to Ventura, Calif. “I told them I didn’t have any details,” Cooper said; nonetheless, he became the go-to expert on the news story that followed, hitting the proper contextual talking points about what to do if you encounter a puma and how many of them remain here (probably 8; maybe 10). It's not that Cooper isn’t an expert — he is. But as an independent biologist, he concentrates his work on the east side of the Santa Monicas, a place called Griffith Park, where one lone puma recently took up residence for the first time in recorded history. But the lion killed on the road came from an area far to the west, an island of habitat, bound in by development and freeways, that’s been under intense study by another group of researchers. (For more information on that research, see our March 2013 story "Will Los Angeles bring its cougars back from the brink?") But those people, the ones who have captured and collared and tracked a couple dozen of the animals since 2002, weren’t available to either reporters or their fellow biologists when the lion was killed on Monday. They couldn't even answer the phone. They work for the National Park Service. “It drives home the point of how much the federal government is leading basic biological research in this area,” Cooper says. Especially in the Santa Monicas, where the state and universities work hand-in-hand with the NPS on everything from tracking rare plants to preserving open space. Two NPS biologists in particular, Seth Riley and Jeff Sikich, have been leading the mountain lion study, “and we’ve left it up to them because they’re the ones doing it and they’re doing it well,” Cooper says. “It puts it in relief what they do." 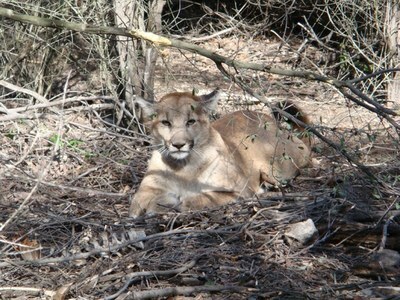 Puma in the Santa Monica Mountains. Photo courtesy of the National Park Service. So, frustratingly and rather astonishingly, here’s all anyone knows so far: The puma died in the eastbound lane of the freeway, which means he or she probably came up from the south. The animal was struck at a place called Liberty Canyon, which is precisely the spot where wildlife advocates and CalTrans have been lobbying for years to build an underpass. Animals can follow a canyon under the freeway from north to south here, but those that come up from the south have to navigate paved development to find that canyon. An underpass would allow animals to safely cross out of the Santa Monicas' claustrophobic range and into the vast wildlands farther north. And clearly one lion on Monday morning could have used it.